Opposition Leader Bill Shorten is ready. You can see it in his eyes. Last Thursday, Shorten visited our offices and spoke in an exclusive interview with Rete Italia. Having spent more than five years as leader of the Opposition, destroyed Tony Abbott’s leadership in record time, almost won the 2016 election, and forced a second change at the helm of the Liberal party, the Labor leader seems just inches away from calling The Lodge home. “I don’t take anything for granted,” Shorten assured us off-air, referring to recent opinion polls. He isn’t lowering his guard, so as not to jinx his chances and simply out of wise precaution, given the number of times elections have seemed to be “already won”, and then lost right at the finish line. 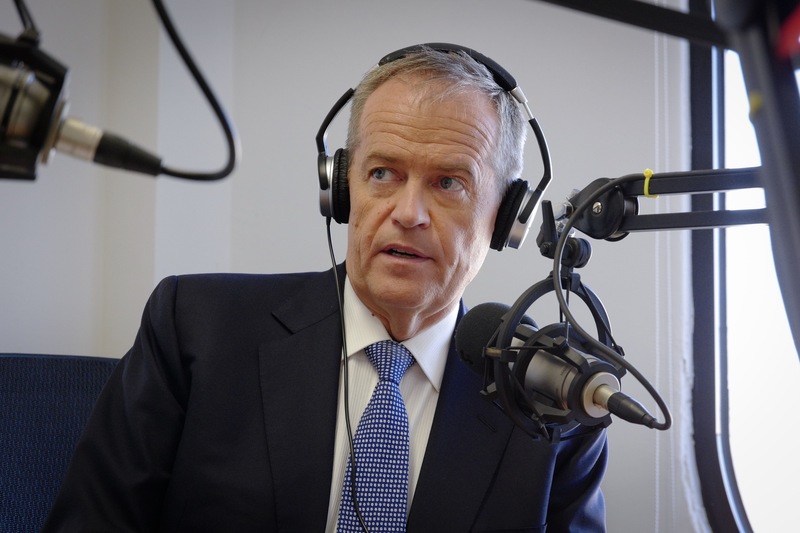 Shorten gave the impression he was genuinely focused on his goal, his future, and what the Labor party intends to do if it manages to return to power. He wasn’t harbouring any negativity and made few criticisms about the government during his time on air. The interview began with an analysis of our nation in terms of an issue which had never entered the realm of political discourse until a few years ago. “Do we have a problem we never thought would exist in Australia?” we asked Shorten. Welcome to Rete Italia, Mr Shorten. I’ve been in Australia for more than 30 years now and I’ve never seen a period like this, where racism is talked about so much. Does Australia have a problem with racism in 2019? I think most Australians don’t. But what’s happened is we’ve seen hate speech spread within the media, on social media and also by extreme political parties. I think we need to draw a line under the page and say that Australia is proud of its immigration history. We want to make sure, of course, that the people we bring here adhere to our laws and respect our values. I think it’s about time this country started to work together a lot more, rather than divide all over the place. We’ve got to have a lot more hope in the national political conversation and a lot less fear. The question of fear has become a national issue every election. Do you feel, as a leader of an important party, a sense of responsibility for this? Is the issue of immigration more complex? Well, I quite agree. Let’s talk about what’s important and then I’ll answer your question specifically. We’re always going to require immigration to this country, and you look at the contribution that Italo-Australians have made to Australia… it’s second to none. So we keep needing immigrants. That said, we don’t want people smugglers or criminal syndicates, who encourage people to sit on unsafe boats for thousands and thousands of dollars to then potentially drown at sea. I do think we should take immigrants in this country. I do think we should be humane to refugees and to other people. But we will have strong borders under a Labor government and anyone who comes via a people smuggler on a boat won’t be processed in Australia. But that doesn’t mean that we don’t have immigration, and it doesn’t mean that people who are in our care shouldn’t be able to receive top-quality medical care, because that’s fair for anyone who is in our care. We’ll keep strong borders, but what we also have to do is change the political debate. I don’t actually blame someone for wanting to come to Australia. We’re a great country. I don’t like the idea that we demonise people because they look different or they sound different. The only people who could really complain about immigration in this country are the Aborigines and they might have a point. We can’t turn back the clock, so what we need to do is make sure that we have an orderly process and make sure that infrastructure in our big cities is keeping up. It’s not the fault of a migrant if you’re stuck in a traffic jam; it’s the fault of a government who didn’t invest in roads or public transport. If your child is at an overcrowded school, it’s not the fault of another little child; it’s the fault of a government who didn’t properly fund education. The reason why your child or grandchild might not be able get an apprenticeship is because the current Liberal government has cut funding for apprenticeships. It’s not the fault of someone else. It has been announced that the government has cut the annual immigration cap by 30,000 people. What is your response? The government is like that cartoon character Foghorn Leghorn, the big rooster who would always walk around in the barnyard and make big statements that never amounted to much. This is a government of Foghorn Leghorns; this is a government that has a lot of conversation but it really isn’t meaningful. It’s a waste of time. They’ve said that they’re going to set the level for permanent immigration to 160,000, but it was 162,000 last year. These guys want a medal for reducing permanent immigration by 1.2 per cent. Seriously? What I would like them to do is, rather than pick on migrants, they properly fund our schools and our hospitals. The current Minister for Home Affairs, Peter Dutton, said that if a sick refugee was able to go to hospital it means that an older Australian wouldn’t be able to. That’s just a lie. That’s rubbish. Hospitals see millions of people every year. So what we need to do is get the debate back where it should be. I want migrants, just like I want native Australians, to obey the law and pay their taxes. I mean, this government wanted to give $17 billion to the big banks, and yet a lot of big companies don’t pay the taxes they should pay and therefore, your ordinary taxpayer has to pick up the bill for the hospitals and the schools, which is fair enough. But this is a government who is soft on the top end of town and wants us instead to be afraid of people from overseas. On the issue of wages, you came up with the idea to increase the living wage and you say often that you will somehow increase wages that are at the moment at the same level as five years ago. They are all nice things but how can you achieve them? How can you force a movement? I’d be happy to explain. I appreciate that you think they’re nice things, but they’re also important to the economy. Wherever I travel in Australia I talk to pensioners, small businesses and workers… millions of them. They all agree that everything’s going up except wages. You’d have to have been in this country for over 60 years and even then, you wouldn’t have seen wages grow as low as they are right now. This is the lowest wages growth since we’ve been keeping records 60 to 70 years ago. In the last four years, corporate profits went up 45 per cent. So some people are doing very well. The problem is that wages in Australia on average are increasing over the same period of four years only by 8 per cent. And the problem with low wages growth is that we create a more unfair country. Another problem is that when millions of wage earners have wage stagnation, everybody loses. We propose some specific measures to lift wages. This government accepts and supports cutting the penalty rates of shop assistants and hospitality workers on Sundays and public holidays. This has literally cost hundreds of thousands of Australians hundreds of millions of dollars. This government doesn’t have a view about how to ensure better pay for women compared to men in feminised industries like childcare. Childcare is an industry where predominantly women are employed and their wages on average are lower than in male-dominated industries. What could be more important than raising our children? We want the minimum wage to be a wage which an adult can live on. We want to also look after small businesses. We’ve got a lot of contractors out there such as concreters, tilers, plasterers and bricklayers who do work for bigger companies. The client pays the big contractor the money and the big contractor gets smaller contractors to do the work. But all too often in Australia, the big contractor who has got the money from the client goes broke and the poor old small contractor has done the work and is left holding the bills. So we’re going to start protecting subcontractors too. We have got a range of sensible measures. We’ve also said that for people who are labour hire workers – and there are many of them – if they’re working alongside someone who works in a business, we want them to be paid the same as the direct employee of the company. That protects the job security of the direct employees, so they can’t lose their job to a cheaper worker, and it also lifts the standards. Do you know that when Bob Hawke and Paul Keating got elected in 1983, around 87 in every 100 Australians at work had a full-time job. Now, it’s about 68 in every 100. While people have got part-time work, that is often not enough to live on. I’m not sure if you know that one million Australians now hold two jobs just to make ends meet. There are plenty of people who work in aged care and haven’t had a pay rise in years. We do need to address these matters and we’ve got some specific plans to do it. The government says, “Oh well, you can’t do anything about low wages”. Yes, you can. They say, “But even if you lift the wages of people then that will lead to unemployment”. The United Kingdom recently increased the lowest wages by 22 per cent. Employment increased. It’s as simple as this. You and the listeners know these people. They are your neighbours and their neighbours. There’ll be listeners here who have family members working in aged care on the night shifts just to pay the bills. They haven’t had a pay rise in five or six years. It’s getting hard under this government because they’ve cut funding to Medicare and the cost of seeing doctors has gone up. It’s getting hard under this government because they are at war with renewable energy. Energy prices have gone up and now wages are not moving at all. We’ve made it clear that any wage increases have to be based on discussion with the capacity to pay, but we need to move wages. Don’t tell me everyone’s doing it hard in this country. Corporate profits are up 45 per cent. Wages, 8 per cent. Someone’s doing very well. It just doesn’t happen to be millions of wage earners. This country is becoming more unequal. In Australia, we like to compare ourselves to the OECD nations, the “club” of First World and developed nations. Did you know that for productivity growth (the amount of effort that people put in and the amount of output for the same effort), we’re second in the world? Denmark’s first, we’re second. So our productivity growth over the last few years has been sweet, but for wages growth, we’re 27th. So Australian wage earners are working hard and doing their jobs but they’re not getting the rewards, and that’s not the Australian story. Of course, employers have to make a profit. But if workers aren’t getting a wage rise, people don’t spend money. They don’t go out for breakfast on a Sunday. They don’t have the money to send their child on school camp. They don’t have the ability to replace all four tyres at once if police pull them over and say they’re a little bald. There are a lot of Australians who are increasingly spending their savings just to make ends meet. Talk to the pensioners: for a pensioner, opening an electricity bill requires a bulletproof vest. It’s scary. There will be people listening on your network of radio stations who have to weigh up buying the blood-thinning medication necessary for their heart or the power bills. It’s day 12 and it’s day 14 when they get the next pension. They’re making life and death decisions, almost literally, on how they live. This country is getting less equal. That’s why we’ve got to move the wages. When millions of wage earners have stagnating wages it affects everything. Il Globo circulation remains resilient, but you don’t ever want to get to a point where people view buying a newspaper as a luxury because they don’t have enough money. And you mentioned the energy issue. The prices are out of this world and it’s very hard to understand why there has been this big jump. Secondly, it’s hard to understand why the major party cannot find a common program and instead they are just using this energy issue as a punching bag for political reasons. On the second issue, Labor has got a clear view and I don’t know why they find it so hard. For people thinking about voting for the Liberals or the Nationals at the next election: don’t do it for the energy policy because if this government was actually going to get its energy policy right, Malcolm Turnbull would still be prime minister. They’ve had 12 energy policies, three prime ministers and 22 reshuffles. If energy and climate change are important issues to you, then you wouldn’t be voting for this government. It would be the triumph of hope over experience to give this government a third go after we’ve wasted six years. Specifically, the reason which drives people to the edge of despair is, at one level, the massive increases in prices. But at another level, we can read the newspapers. We understand that we should be an energy superpower. There are European countries who would love our access. We’ve got gas under the ground, we’ve got gas offshore and we do have coal, but we’ve got the world’s best sunlight. And in parts of Australia, we’ve got the world’s best wind. We’ve got the world’s best scientists. How is it that Germany, which has one third of our sunlight, has a renewable industry more than three times ours. This country has got to start realising that we can do better. And the reason why power prices have gone up is because the national government, under the Liberals and Nationals, can’t agree, and no one’s going to build new power generators, or certainly not to the volume we need, if they don’t know what the rules are. How can you ask a football team to go onto a field if you don’t know where the lines are? The reason we have got higher energy prices isn’t because of renewable energy, and it isn’t because of the Labor Party. It’s because the government can’t set up an agreed set of rules which will encourage investment and new power generation. We will change that. We use some of the ideas that Malcolm Turnbull worked on with some of our own. We’re going to have a view in which coal and gas will still be part of our energy mix. We’re not like the old Greens, but we’re going to do much more than the government. I know a lot of people listening here will be parents and grandparents: we don’t want to hand on a worse deal to our kids to fix up because some of our current politicians were too lazy, or too weak, or too disinterested, or too out of touch to tackle climate change. Good environmental energy is good for economics, it’s good for jobs and it’s good for the climate. The emissions reduction target is changing all the time. The government is happy with the agreement they made in Paris. You are offering double that. We’re doing exactly what most European countries are already doing. You can do it by a combination of carbon pollution reduction in a range of sectors. Countries are already doing what we should be doing. We can do it through smarter land and agricultural policies, smarter transportation and smarter policies in our industrial companies and our electricity sector. We are going to use what Mr Turnbull worked on and work with industry, environmental groups, experts and scientists – not the propaganda merchants of the far-right – and we will just work up what Mr Turnbull had done a fair bit of work on already and present that to the Parliament. One thing we’ve already said we’re going to do is focus on solar. Two million Australian households have solar rooftop. People don’t put solar rooftop panels on for decoration. They do it because they want to gain control over their energy prices. Two million households. We want to start using the massive advances in battery technology so that we can store the energy so that it’s acquired during the day and is available at peak times at night when the kids are on the computers and Mum and Dad might get a chance to watch Netflix. This is where helping roll out solar batteries will give those households which have solar a greater start, and I think it’ll encourage more people too. The batteries are very expensive. Will there be a discount? We get that they’re expensive. I want us to be a country that makes batteries here. We want to provide cheap finance, but we don’t give away things for free because I generally find that if we want to roll it out, we want people to be engaged in the quality of the product. But we’ll provide cheap finance and work with the industry to make sure we get the price of batteries down. I think most Australians would say if it was at a reasonable cost, they would like solar on the roof top and a battery. So we’re going to work with the people. And healthcare is always a big issue. There is absolutely no more important issue in Australia than healthcare. In politics, we over-complicate: if your family is OK and your health is OK, then everything else is okay. We’re going to restore the funding which has been cut in the hospitals and we’re going to unfreeze the patient rebate so that starts going up again. The government is starting to do it but for six years they’ve increased the out-of-pockets. And we’re going to do other exciting projects in healthcare which we will announce between now and the election. Will you cut the 30 per cent rebate in private health insurance? No, we’ll keep the rebate. But we are telling the private health insurance companies that we’re going to cap their fee increases to 2 per cent a year. You heard it: 2 per cent per year. We’ve got to get these price increases under control. The private health insurance industry gets over $6 billion in taxpayer support. Yet they’ve increased the cost of premiums by 55 per cent in the last 10 years, and the amount of exclusions in policies has gone up not down. If they’re getting $6 billion of taxpayer money, we want to see a bit better performance from the private health insurers. But we still think it’s an important part of our medical system. What do you expect from the Aged Care Quality and Safety Commission? I think they’re going to say that the cuts of the government in the last three years have been disastrous. When the current Prime Minister was treasurer in his first budget, he cut $1.2 billion. Then in a mid-year economic statement, he snuck in another half a billion dollars’ worth of cuts. You can’t cut aged care and make it better. Ageing is inevitable, but what we need to do is pay the workers better and put more money into it to improve the standards. There are no shortcuts to quality aged care. There are 410,000 of our fellow Australians currently living with a diagnosis of dementia and that number’s going to go up. There are families caring for them. One of the things which make Australia a great country is our national healthcare system. Wherever we go in the world we talk about our healthcare system, but it’s under pressure as we live longer. You can’t cut the system and expect it to be better. Labor will find money in the budget to look after healthcare, close down loopholes for multinationals and wind back unsustainable tax subsidies. For me, it should be your Medicare card, not your credit card, which determines the quality of health care in this country. This story appeared in the Monday April 1, 2019 edition of Il Globo. We’re always going to require immigration to this country, and you look at the contribution that Italo-Australians have made to Australia… it’s second to none. It would be the triumph of hope over experience to give this government a third go after we’ve wasted six years. For me, it should be your Medicare card, not your credit card, which determines the quality of health care in this country.